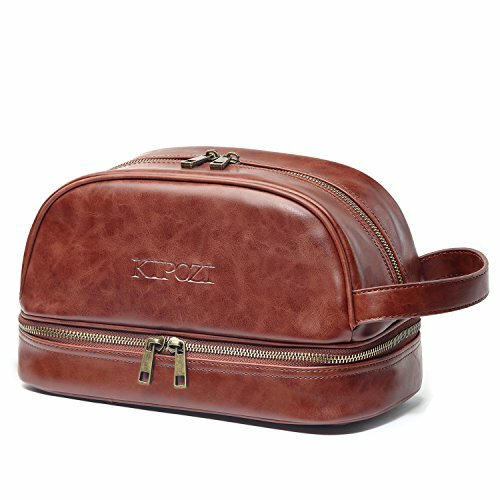 KIPOZI Mens Toiletry Bag PU Leather Dopp Kit Travel Toiletry Bag is currently selling at $29.99, which is its normal price. It has a lowest price of $29.99 and is selling within its usual range. Price volatility is 0.15% (meaning it does not change often), so you might have to wait a while for the price to drop. Until then this is a recommended 'ok deal'. The current deal is also the best price on this item over the last month. 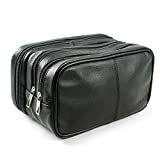 Compare the current price, savings (in dollars & percent) and Buy Ratings for the top Mens Toiletry Bags that are closely related to KIPOZI Mens Toiletry Bag PU Leather Dopp Kit Travel Toiletry Bag. 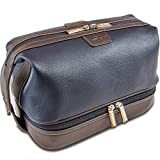 Here is how KIPOZI Mens Toiletry Bag PU Leather Dopp Kit Travel Toiletry Bag compares with other leading Mens Toiletry Bags. 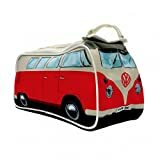 KIPOZI classic toiletry bag exudes honorable & luxury,brings you convenience and fashion. Premium QualityThis Dopp Kit made of durable waterproof high-grade PU leather and inner nylon lining with mesh pouches,strong zipper and highest-standard workmanship. How to maintain high grade PU leather bag?1. Soak a cloth or sponge in water and wipe down your surface.2. Use a bar of soap on tougher grime3. Wipe away any soap with a wet cloth.4. Let the surface dry.Please Note: Don't be under the blazing sun or rain for quite a long time.With all these maintenance steps above, you will enjoy more about that KIPOZI travel kit bag has brought to you!